Top on our list of places to see when visiting Durham was the World Heritage Site castle and Norman cathedral. Construction of the castle began in 1072 under orders of William the Conquerer. A surprising and interesting fact about the castle is it's been lived in continuously since the 11th century and it's now home to students of University College, Durham. 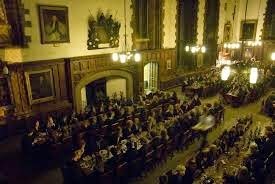 That means these very fortunate individuals eat three meals a day in the Great Hall - think Harry Potter with a degree! Because the castle is a residence, tourists are allowed inside only via a tour. No problem there. We had a lovely guide, a young PHD student from San Francisco, who showed us around and provided all sorts of interesting tidbits about life in the castle. Unfortunately, no pics were allowed, but we were able to take photos of the exterior. Upon entering the main gate and scanning left to right these following three photos provide a good idea of the immensity of the castle and its grounds. The Cathedral was built in 1093 to house the shrine of St. Cuthbert. The cathedral is the only one in the UK to retain all of its Norman craftsmanship. This knocker is a replica of the original, but the history of its significance remains the same. Anyone needing refuge could knock at the giant doors of the Cathedral and request asylum. The individual then had 30 days to get his (or her) house in order before having to leave. The interior is breathtaking even in 2014. It boggles the mind to imagine how a medieval peasant might have felt upon entering such an impressive place. Directly above the pointed archway in the middle is the bell towner. Peering upward actually made my neck ache! The Bishop of Durham's balcony is directly above where John is seated below. The balcony provided the Bishop the best (and most prestigious) seat in the house. To John's far right is the shrine of St. Cuthbert. The doorway where I stood to take the above photo is a work of art on its own. At the far opposite end of the cathedral is the ladies chapel. While I enjoyed the serenity of St. Cuthbert's shrine, I personally relished the peacefulness of this female-only chapel. A lovely volunteer pointed out the paintings and reminded me that once every square inch of the chapel and cathedral would have been decorated with these images from the Bible. All this sightseeing, of course, requires sustenance and after a busy morning we headed to the cathedral cafe. Situated between the cafe and the gift shop is a LEGO replica of the cathedral. As you can well imagine upkeep and maintenance of the cathedral is an expensive endeavour and to raise funds (and make it fun) the public is able to help build the Durham Cathedral out of Lego blocks. The real cathedral took 40 years to build...the LEGO version is expected to take two years before it's complete. So, we purchased 4 blocks (2 for us, plus one for our daughter and son-in-law). We helped construct a stained window. Wherever one is in Durham, the castle and cathedral dominate the skyline. It's a glorious impressive sight and well worth a visit, or two, or three.